Nina Simone (vocals, piano), Orchestra arranged and conducted by Bob Mersey. Recorded 1959. Nina Simone (vocals, piano), Jimmy Bond (bass) Al ‘Tootie’ Heath (drums). Recorded September 1959. Nina Simone (vocals, piano), Al Schackman (guitar), Chris White (bass), Bob Hamilton (drums). Recorded 1961. Nina Simone (vocals, piano), Al Schackman (guitar), Chris White (bass), Bob Hamilton (drums). Recorded Newport, June 30 1960. Nina Simone’s intensity as a performer largely survives what were often unsuitable musical settings; as a performer she was full of spontaneity and created a great sense of intimacy, at odds with the kind of over-orchestrated and string-ridden settings producers sometimes created for her. But she is best appreciated when heard with a small group under her own leadership. The difference is illustrated on this 2 CD set of reissues from Avid. There are times on The Amazing Nina Simone (such as ‘Children Go Where I Send You’) when we hear the ‘real’ Nina; but there are others (e.g. ‘Willow Weep For Me’), when the arrangements by Bob Mersey seem to serve merely to dilute the impact of Simone’s playing and singing. On Nina Simone at Newport, on the other hand, where Simone is working with her own regular group (her own piano is joined by guitar, bass and drums) is full of Simone’s raw intensity and her power of communication with an audience – her own joy in the rapport with an audience is audible at several points. Simone is almost always heard at her best in ‘live’ recordings. In its essence Nina Simone’s work seems to emanate from some point deep in her soul – to a degree matched, among other singerts, only by Billie Holiday (and Abbey Lincoln at times) – so that it has a unique authenticity. Over-arranged settings cloud that uniqueness and intensity. On Nina Simone at Newport, however, both her piano and her voice pack an emotional punch (sometimes almost too much so!) which is often absent from her studio recordings. Even when she is not singing, as in the instrumental ‘Nina’s Blues’, quirky and unexpectedly powerful, there is much to admire and enjoy. Despite its title Nina Simone At Town Hall is actually a mixture of ‘live’ and studio recordings. In both settings, Simone benefits from top-class support from bassist Jimmy Bond and drummer Al ‘Tootie’ Heath (who are, strangely, not credited in the Avid packaging). The difference in quality (aesthetic or ‘sound’) between the live and studio recordings is not great (the studio recordings – made after the concert – are of songs previously performed live then). ‘You Can Have Him’ has Simone’s characteristically visceral power, her distinctive weight of voice and emotion. She commits herself fully to a wide range of material, whether that be a standard such as ‘Exactly Like You’, a traditional number such as ‘Cotton Eyed Joe’ or a modern ‘classic’ like ‘Summertime’. She makes each of them, very decidedly, her own – her versions of these songs would never be mistaken for anyone else’s. As with Billie Holiday almost every song feels autobiographical, even when one knows very well that it can’t be any such thing. On Forbidden Fruit, working with her regular group of the time, Simone sounds very comfortable. Her earthiness of voice and manner is striking; this is one of her albums which implicitly makes the necessary points she was later to make more explicitly (in words at any rate), points about Civil Rights in America and about the rights of women. But it is a mistake, I think, to imagine that the political dimension of Simone’s work is ‘merely’ a matter of ‘ideas’. It is the product of her artistry, of her capacity to ‘hypnotise’ an audience. She saw her role as an artist as being “to make people feel on a deep level”. That was something she frequently did and in stirring the feelings she sang out of and about she made her socio-political point, which was, after all, a point about a common humanity. 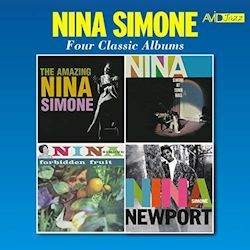 Of the four albums reissued here, perhaps there is only one that is truly ‘classic’, Nina Simone at Newport; but both Nina Simone at Town Hall and Forbidden Fruit are not far behind, and even the somewhat misconceived Amazing Nina Simone has its moments. This 2-Cd set is great value for money – making it an economical way to start a Simone collection, or to pick up any of these four albums missing from such a collection.